Lowena's a real gamer, so unlike so many people outside of Japan, she knows how cool SNK really was! Capcom may have Lowena's and my favorite characters, but overall, I think SNK has more cool characters than any other company. This is a really cute picture! 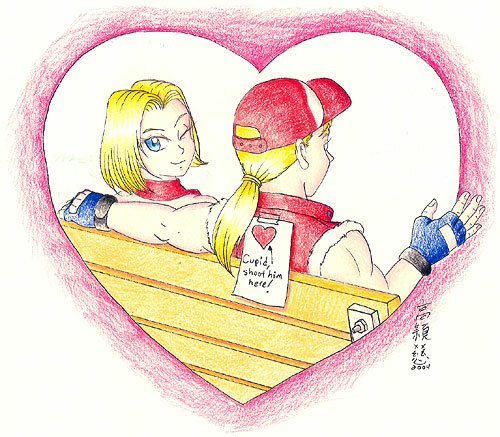 But, I don't think Blue Mary needs to worry because no guy needs to be shot by cupid to fall for her. You gotta wonder what Andy's problem is! Every dude in the world drools at the sight of Mai Shiranui, but for some reason, Andy's still in the dark. Hey, but at least we know that the DO eventually marry and have kids (play Garou: Mark of the Wolves). Again, I gotta think that Terry is not only the coolest guy in video games, but also the luckiest! Blue Mary is as cool as any girl without pigtails could ever be!! Gotta love Yuri because she's one of the most fun characters. And hey, and she looks pretty good in a swimduit too. ...so take off all your clothes. In case you don't get the reference, that's from a popular song by Nelly. 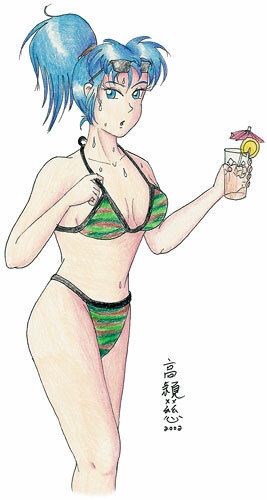 Anyhow, this is KoF's Leona in a cute camo bikini. Here's a nice little black & white picture of two of my very favorite characters. As usual, it looks like Mary is using her feminine charms to mess with poor Terry's head. But, I'm sure it's all in good fun! I've always found the French to be extremely rude, but nevertheless, I can't help but love Charlotte! 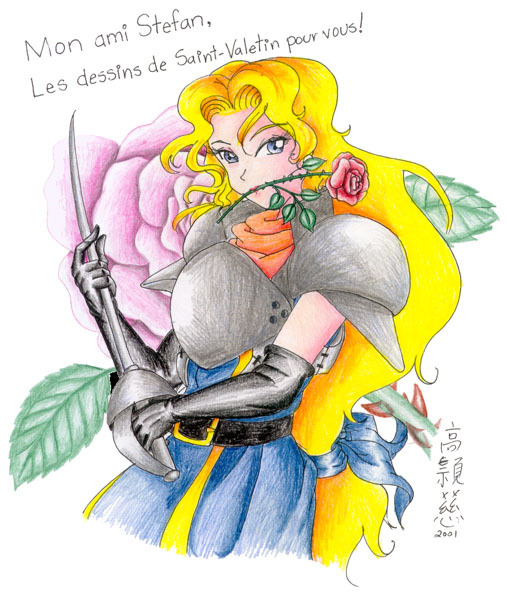 As far as looks go, she's gotta be one of the best looking game characters... as you see here in Lowena's picture. 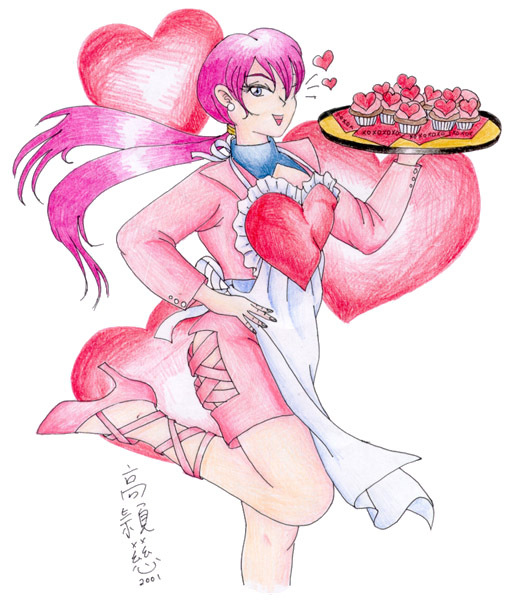 One minute she's suplexing people in a fight, one minute she's playing in a band, and the next, she's baking cupcakes for Valentines! Shermie's of of the coolest and most unique characters, so it's very nice to get fanart featuring her. By the way, this picture went up on Feb 13, which happens to be her birthday! Here's a black and white picture Lowena made of SNK's leading lady, Mai Shiranui. She's been around almost 10 years now, but unlike Chun Li, she hasn't gotten boring at all. This is a letter Lowena once sent me! Pretty cool, huh? Not only that, it was filled with fanart too. I scanned almost all these pictures in this gallery from the originals that Lowena was nice enough to send me.